My friend Sandy who owns Paint Me White in Mudgeeraba on the Gold Coast recently came to stay and brought me some of the recently released Annie Sloan Gilding Wax. Gilding waxes are the closest thing to the look of real gold leaf but are so much easier to apply. 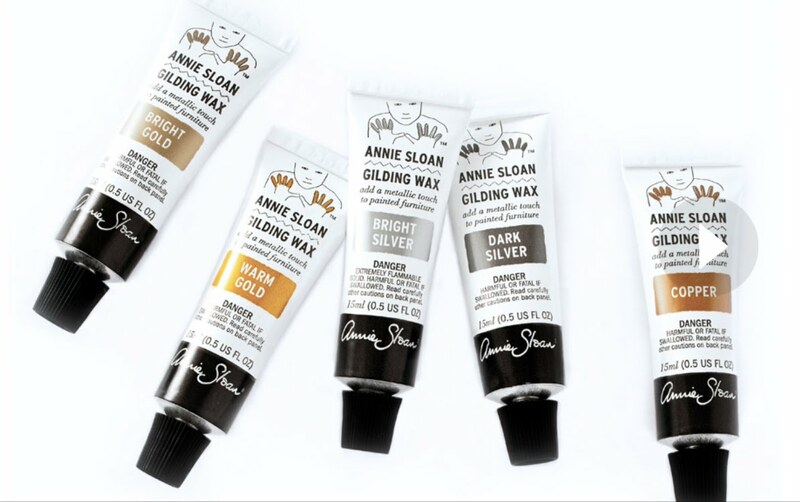 Annie's Gilding Wax is very similar to RubnBuff gilding wax. I have used RubnBuff for many years for changing the colour of handles or adding gilt details. I had some bedsides that I thought were the perfect project piece for testing Annie Sloan's Gilding Wax. Using Gilding Wax is super easy. Be mindful that a little goes a long way. Once you have finished painting, distressing and waxing your piece you are all set to use the gilding wax. It should be the last step in the process. As Gilding wax is a wax you don't need to put anything over the top to protect it. If you wax over the top you will dull the shine. You can just spread it on with your finger or you can use a brush. I taped the legs of my bedside tables with blue tape first then just smeared on the wax with my index finger. I found the ASCP Gilding Wax to be slightly grainier than RubnBuff but it gave a nice hand rubbed finish. Once the wax has had about 20 minutes to harden you can buff it to a shine with a microfibre cloth. If you are using this on hardware just brush the gilding wax on the same as you would on your furniture. No preparation is needed on metal. If you make a mistake and get the gilding wax on an area where you don't want it, just use a little of the clear wax on a rag and wipe off the extra gilding. The gilding wax comes in a range of metallic colours. I am looking forward to trying out a few more. What an interesting idea. I had never heard of it before. I have a screen I may use some on. I've used the rub n'buff product to great effect in my new home. The dining room chandelier was pleasing in form but was kind of a rusty brown with a green patina. I rubbed it all over with silver rnb and it now looks terrific with the new, lighter, paint job on the walls and trim. I painted a small table with charcoal and paris gray chalk paint and used the silver to highlight leg turnings to great effect. A gray chalk painted table and chair set, accented in the same way, graces the kitchen eating area. I'm sure Annie's product is fine but I still have some left in the $8 (US) tube!